When the San Francisco Examiner endorsed the McCain-Palin ticket in 2008, it exposed how out of touch the paper’s Colorado Republican publisher is with our City. It’s still a running joke in town, with a few local politicos even calling it the “Sarah Palin Examiner.” But after Phil Anschultz bought the Examiner in 2004 from the Fangs (who at least were local conservatives), he expanded his tabloid empire by launching sister publications in other cities. And the front page of yesterday’s Washington Examiner was worthy of Glenn Beck. In a brief video for Organizing for America, President Obama had urged supporters to mobilize the first-time voters who made his victory possible in 2008, and get them to vote again in 2010. 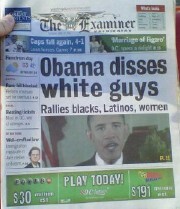 Obama mentioned the historic turnout of “young people, African-Americans, Latinos, and women.” Which was enough to make the Washington Examiner conclude he has a deep-seated hatred of white people, as their headline so aptly shows.